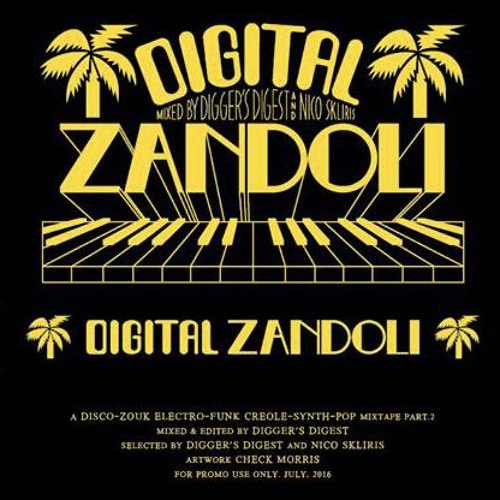 PRE ORDER Here http://diggersdigest.com/shop/product/digital-zandoli-mixtape-volume-2-by-diggers-digest-dr-nico-skliris/ Available for shipping 15 september 2016 After the release of DIGITAL ZANDOLI our critically acclaimed new compilation/project in collaboration with Heavenly Sweetness, we are really proud to announce the released of the 2nd volume of DIGITAL ZANDOLI THE MIXTAPE by Digger's Digest & Dr. Nico Skliris. Another 85 minutes of boogie-zouk, carribean funk, tropical synth music. As on the first volume SIDE A is available for free streaming on our soundcloud. B side and full tracklist will be only available on this actual tape (Means you have to spend a few €, dig out your vintage Walkman or Ghetto Blaster to enjoy the B side). Tapes collectors be quick ! This time it is limited to 75 copies. Artwork by Nico Motte from Check Morris, masterized by Baptiste Pataut @Vrai Son. @1989_1984: Do you know the intro song? I Like It a Lot !!! Real zouk is back! compilation will be released on CD etc.. right, as vol.1 ?